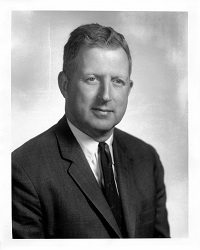 Robert D. Cross joined the University of Virginia as Dean of the Faculty of Arts and Sciences and Professor of History in 1972. After stepping down from the deanship, he joined the Corcoran Department of History full-time, retiring in 1994 after a distinguished career as both historian and university administrator. Born January 21, 1924, in Grinnell, Iowa, Bob Cross was a B-17 pilot in the Army Air Force from 1943 to 1946. Proceeding to undergraduate studies at Harvard, he majored in history and literature before entering the Ph.D. program there. He earned his Harvard Ph.D. in 1955 in the history of American Civilization. Bob taught history first at Swarthmore College from 1952 to 1959 and then at Columbia University until 1967 where he chaired the History Department beginning in 1964. He left Columbia in 1967 to assume the presidency first of Hunter College (1967-1969) and then of Swarthmore College (1969-1972). Bob’s most influential publication, his book The Emergence of Liberal Catholicism in America (Harvard University Press, 1958), shows how ecclesiastical and political institutions that seemed to exist in separate worlds interacted in the realm of social and religious history. In the Corcoran Department, Bob was widely admired for his erudition, which he wore lightly but shared generously with younger colleagues and graduate students who sought his counsel. He was also deeply committed to undergraduate education, regularly teaching liberal arts seminars and serving for several years as an Association Dean advising students in the College. He received a Lifetime Achievement Award from the Virginia Society of History Teachers for his unrelenting support of history teaching in the secondary schools. Bob Cross died in 2003. With the Robert D. Cross Memorial Lecture, the Corcoran Department of History honors the memory of this beloved colleague. 2018-19: Claudrena Harold: "When Sunday Comes: Gospel Music and the Politics of Freedom"
2017-18: Paul Halliday: "What Makes a Court Supreme? Some Imperial Answers"
2016-17: Allan Megill: "History's Roots in Sensibility and Difference"
2007-08: Cindy Aron (Fall): "The Exotic, The Neurotic, and the Ordinary: Call Girls in Post-World War II"
2005-06: Melvin Leffler: "Retreat from Armageddon? Khrushchev, Kennedy, Johnson, and the Elusive Quest for Peace"